Our frame depth calculator is a handy tool to make sure the frame you order is deep enough for your artwork package. To determine the depth that you need check the components below that you are using in your frame package and our calculator will determine how deep a frame you need. 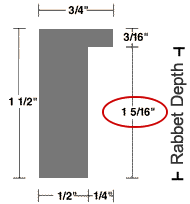 In our ordering section all frame depths are illustrated so you know if the frame is deep enough to accommodate your frame package.